Twelve Optimist sailors started their summer sailing early this year by joining the Eastern Connecticut Sailing Association (ECSA) MudRatz Opti Race Team, which began May 19. 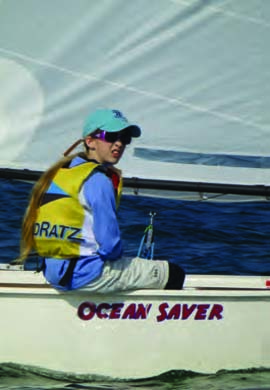 Open to any sailor in ESCA and based out of Ram Island Yacht Club in Noank, CT for the spring, MudRatz was created to help keen juniors develop and improve their sailing and racing skills. MudRatz is a US Sailing Certified Member Organization, with startup funding provided by the ECSA and the Mystic River Mudhead Sailing Association. Learning how to dress for the spring conditions was the first lesson taught by coaches OJ O’Connell and Corey Fast. The six sessions offered the MudRatz opportunities to experience sailing in a variety of conditions, fine-tune boat handling skills, and learn about updated racing rules. “Getting the kids started in the spring was key,” said MudRatz organizer and parent Brandon Flack. “By practicing in breeze, rain, fog and cold, they really learned how to tame the elements and just focus on the sport versus worrying about the weather.” The weather was a challenge, but the kids took it all in stride and kept coming back week after week, mixing sailing into their schedule of usual spring activities like softball, baseball, and lacrosse. A small regatta was held on June 23 to mark the end of the clinics, with competition that was fierce but friendly. During the summer, the MudRatz sail at their home yacht clubs’ programs. The camaraderie established during the spring clinics has made local regattas more fun because sailors have made new friends at multiple clubs up and down Fishers Island Sound. In July, the MudRatz gathered to sail as a team in the Center for Hospice Care Stonington Dinghy Club Benefit Regatta in Stonington Harbor. 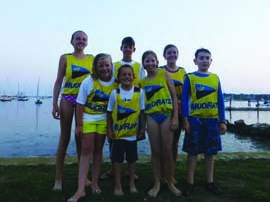 Competing as “MudRatz CARE,” Lily & Dylan Flack, Jacob Freeman, Megan Gimple, Bella McCarthy, and Lisa & Evan Spalding far exceeded their fundraising goal of $250, raising more than $2,600 for the Center for Hospice Care of Southeast Connecticut and placing well in the regatta. The goal of MudRatz is to provide options for enthusiastic kids who want to sail competitively before and after the summer season. Starting in mid-September, MudRatz fall clinics will be held at Niantic Bay Yacht Club in Niantic, CT. For more information, check out mudratz.com. Bequia Youth Sailors Ready to Compete in the USA …and they need your help!